This year’s summer of sport offers more than just an excuse to get boozy in the local’s beer garden. Smart football fans will be using the 2016 UEFA European Championships as an excuse to visit and soak up some of the most stylish cities in the world. Take our advice and skip the chains in favour of cool, bookable apartments. Kicking off with England’s opening fixture against Russia in Marseille on June 11; it doesn’t get much better than a pad situated directly in front of the city’s famous old port, and only around 15 minutes by car from the Stade Velodrome. Available to book now on TripAdvisor Vacation Rentals, priced from £163 per night. Margaret Howell’s love affair with homeware is nothing new. While the British clothing genius has championed quality industrial design in her stores since the 1990s, she frequently hails the Anglepoise lamp as one of the greats. Giving some new life to an old classic, Howell has updated the Anglepoise Type 75, itself a rework of the original 1950s lamp, with two new colours. Described as Saxon Blue and Seagrass, the colourways won’t be available until September but any switched on design-lover will know to pre-order now. Available to pre-order at Anglepoise, priced £130. If Action Man was in the market for a watch, we’d point him in the direction of Storm’s new Raven model. The brand’s very own tough guy timepiece features a strap made from high tensile Kevlar, which is five times stronger than steel, as well as a shock resistant black carbon fibre case. Water resistant to 50m and complete with glow in the dark hands and date functionality, it’s enough for anyone defending the free world while also moonlighting as a ninja, deep sea diver and spaceman. Available at Storm, priced £179.99. When US-based Grovemade decided to produce its first ever penknife, it set only one brief: to make it “the most beautiful knife” available. Although more used to turning out #deskenvy accessories like laptop stands, the result is a triumph. Based on the classic Japanese Higonokami design, one of the oldest knife trademarks still in production, it is crafted from a single-piece of machined stainless steel coupled with hand-sanded and finished hardwood body in either maple or walnut. Available at Grovemade, priced £115. Lyle & Scott’s debut London Collection represents the next chapter in the British heritage brand’s 141-year-old history. 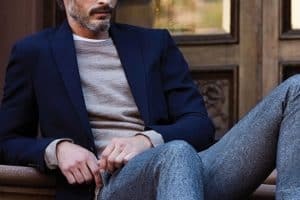 Manufactured entirely in the capital, with some pieces using fabrics milled by the London Cloth Company, the focus is on soft tailored separates and knitwear in cashmeres, linens and silks. The selection of unfussy yet refined pieces marks a smart step change for the brand and our pick is the half-lined herringbone blazer. A lightweight take on a classic style, throw it over a T-shirt for ultimate summer smart-casual vibes. Available at Lyle & Scott, priced £150. Marine skincare sounds like something that’s going to come with all sorts of fishy claims. Nonetheless, Thalgo has touted the power of the deep blue sea as a way of creating a range of products and treatments since 1964. Despite becoming a mainstay of spa resorts worldwide, the French skincare brand is an unsung hero in the grooming arena. Thalgo’s new Men’s Grooming Kit brings together two of its best-selling products. As long as the idea of putting algae on your face and body floats your boat, you can benefit from the cell renewal and anti-ageing properties of the The Wake-Up Shower Gel and Regenerating Cream. Available at Thalgo, priced £29.95. Gone are the days when brick-like devices could hold a charge for days on end. With almost every detail of day-to-day life reliant on being on-grid, having a charging cable to hand at all times has become a necessity. A far more artisan alternative to carrying around a frayed, once-white piece of wire is a neatly concealed connector made from quality Italian leather and finished by hand. Available in both black and tan, Native Union’s Tag invention is designed to loop around any bag or key holder. Available at Native Union, priced £39.99. Deborah Carre and James Ducker have been a best kept secret of the shoe world for some time. Having honed their craft running the bespoke footwear department at Savile Row tailor Gieves & Hawkes, the pair is slowly branching out with ready-to-wear designs under their own brand. Carreducker just completed a Kickstarter campaign to fund an all-new range of desert boots, meaning they are now available to pre-order. The made-in-England styles come in an array of colours and leathers including vegetable tanned calfskin and nubuck. The boots won’t be delivered until September – lucky they are constructed using a stitch down method, then, which delivers a waterproof like seal. Available at Carreducker, priced £265. 8 Pedicures For Men: Is It Time You Got One?